700,000 people are currently living with a brain tumor. Head for the Cure is a non-profit organization that raises funds, awareness and hope for the Wichita community. The funds raised benefit Dragon Master Foundation. 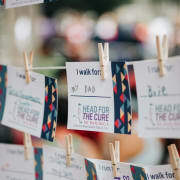 Why volunteer for Head for the Cure? 5:30 a.m. - 11 a.m.